As more veterans than ever come to appreciate how cannabis can heal, they still face consequences. Grant them access now. With the recent day honoring our soldiers who made the ultimate sacrifice, Americans need to think about how we treat our veterans who actually survive, only to bring the war home in their minds. Why are we not giving them every opportunity to heal? They fought for our nation, and our freedoms, should they not get those same freedoms? 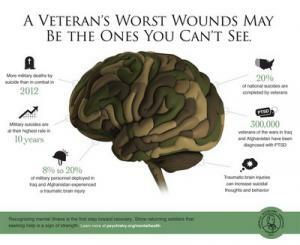 Many people suffer from PTSD, and not all are veterans. Victims of domestic abuse, those involved in traumatic accidents, people who have an event affect them in a delayed manner on an emotional and psychological level can all suffer from post-traumatic stress. For those fortunate enough to live in a state that allows medical cannabis use for the condition, they have at their fingertips a treatment that stops the night terrors, eases the fear, relaxes the mind, and relieves the soul. Men and women who serve their country, any country in the capacity of a soldier face violence and trauma on a scale most of us will never comprehend. The Post Traumatic Stress they incur is in a category of its own. Combat Related PTSD. For these people, even in states that allow cannabis use for recreational adults, let alone medical, using cannabis can lead to a denial of their hard earned benefits, and rejection at VA clinics. The VA spends billions a year treating PTSD, but for most, the treatments are miserable failures. Veterans are given opioids which lead to addiction, antipsychotics, sleeping aids and a cocktail of other pills, which react in their systems causing more problems than the person had before. I am a former military member, as are many of my friends and family. To give you an idea of the hardships they face with prescriptions, I will share one of their stories. His tale starts in the Army; with tours that went to Afghanistan and Korea, back and forth. He was one of the youngest men to make Seargent in 25 years. Standing in line at a base in the Middle East for a vendor of snacks, he watched the line ahead. One moment, he was wishing the line was shorter, the next second, dozens of people were dead in front of him as a mortar hit. Had he been 2 people further ahead in line, he too would be dead. Body parts were everywhere. This soldier, in his years of service, saw fellow soldiers crushed into paste in helicopter crashes where bodies had to be carried away with shovels and buckets. Men he knew. Others he would find after they had taken their own lives. Yet he and a few close friends would time and again have explosions miss them by inches, even in latrines. He eventually suffered a back injury that necessitated the fusing of vertebrae, and his separation from service. With the VA pushing opioids for the back pain, pills for night terrors, pills for depression, pills for alertness in the day to counteract the sleeping pills, and pills for the side effects of the other pills, this soldier developed a severe side effect. Somnambulatory driving. That’s right. He would sleepwalk, carry on extended episodes of activity, and even drive vehicles in his sleep. In one episode, he “woke” to find his dog missing. He called for it. Searched the house. Looked around the farm, all while asleep. Then he went inside and grabbed his keys. Driving his Hummer frantically, not seeing the world in his pill induced haze and sleep state, he rammed it into a pile of scrap metal and the vehicle caught fire. Then he went to the house to get an extinguisher, only to “discover it locked”. He broke into his own house and then went crazy, smashing every window, cupboard, and door. He even called relatives while in this state, saying that the dog was missing. Then he fell asleep on the floor waiting for the dog. When relatives arrived, the dog was right next to him. When he awoke, the house was covered in bloody hand and footprints, littered with glass, and his vehicle had thousands of dollars in damage. The VA prescribed him medications that they knew induced this side effect. It was stated on the bottles. The history was in his file. Had he been given access to cannabis, he would not have had the need of any of those meds. ANY of them. Instead, his life was placed in shambles. Had he been in a more populated area, he could have hit people or vehicles, killing himself or others. He is only 30 years old. Veterans around the country are increasingly calling on the government to allow unfettered access and freedom from the threat of benefits being taken away for using a natural plant based medicine instead of dangerous narcotics and prescription medications. For those who have used it despite the prohibition of the VA, they have been turned away from clinics, been denied refills of medications, and even seen a loss of benefits. This sad injustice cannot be allowed to stand any longer. I was fortunate enough to never see horrors like this as a veteran myself, but for those I have known most of my life that are no longer the same, I weep. The successes of those that have used cannabis are widespread, and impressive. Their stories cannot be relegated to the realm of simple anecdotes, when the results are the same as if they had been in a clinical study, only the were on their own. Anecdote is another word for a story that is not taken seriously. For these men and women, it is life or death serious. Veterans commit suicide at a rate of over 22 a day, and many due to trauma less than the man above. Make your voice heard and tell your government that Veterans need access to cannabis. Every day they wait, fewer of them are left. Are you a veteran that has had his life saved by cannabis? Share your tale with us on social media or in the comments below.